Capacity: The capacity of the jack stand is how many tons or pounds it can hold safely. The bigger your vehicle, the more of a weight capacity you’re going to want it to hold. Buying one that won’t hold your vehicle is very dangerous. Pieces: How many jack stands do you want with your purchase? Do you need just one or do you need more? This should always be compared with the price of the stand. Would you want two for the price of one or one for the price of two? Height Range: How many inches or feet do you want the jack stand to soar into the air? Consider what you are going to be lifting, where you are lifting it, and how much space you need under it to work with. Material: There are different kinds of materials that jack stands are made from. Your top two choices are going to be steel and aluminum. Steel is heavier and sturdier and aluminum is affordable and lightweight. Weight: Do you want your jack stand to be easily moved or do you plan on having it set in one place? The weight of the stand is geared more towards personal preference. However, it can also add to the durability. Warranty: A warranty is a company’s way of saying “we got you”. This is how they back their product against any defects or manufacturer issues. There could be a one-year, two-year, or even a lifetime warranty. The longer, the better. Now we’ve gotten to the part where we go over the top 10 products that made our list. These products are on here because they are considered to be the best jack stands for sale. If you are in a hurry, scroll down to number one. This is our top pick for the safest jack stands that you can find. If you are limited as to how much money you can spend, then check our budget pick at number two. Let’s get down to business! The ESCO 10495 flat top jack stand comes in as our top pick for the best jack stand for sale. Why? You see, safety is an important part of automotive repair work. Jack stands are what keep the cars or trucks in the air without worry. This particular jack stand does just that. The ESCO 10495 has the ability to adjust from 13”-21”. This jack stand can lift a variety of different cars at different heights. You’ll also never have to worry about scratching any paint with these either. They have a rubber pad that protects against such a thing. The circular base helps to provide stability so that you can be assured that your car or truck isn’t going to roll. The powder coated base of these stands help to prevent corrosion and these protect car frames. Based on the jack stand reviews, these are by far some of the safest jack stands available. This lightweight jack stand has the ability to handle a large range of vehicles from small cars to light duty trucks. 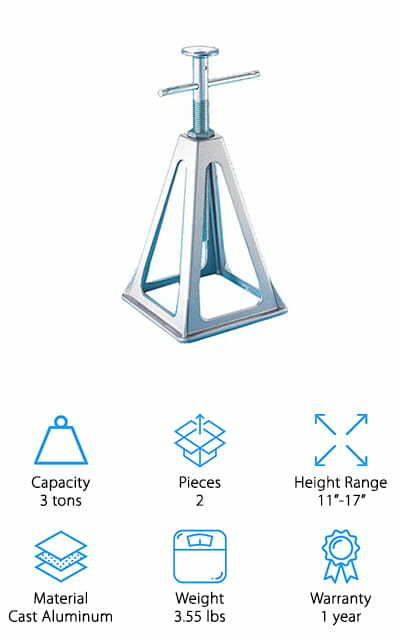 You can choose from 2, 3, 6, and 12 ton stands, but the 3 ton is the most popular. These are made from a solid high-grade forged steel material with a welded frame for added durability. The height range of these cheap jack stands go from 11.22 inches to 16.7 inches with a 6,000 pound weight capacity. These have a large saddle area to allow for better contact with the supported load. The foot base is large, coming in at 7 ⅝ by 6 ⅞. It also meets ASME safety standards. These jack stands are painted a red color, so if red is your favorite, then this must make it much more appealing to you. They are actually quite pleasing to the eye and affordable enough for you to purchase multiple. Are you looking for jack stands that are capable of stabilizing your RV or camper? 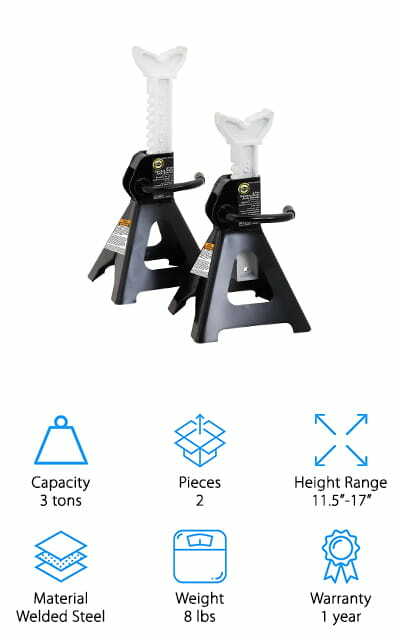 The Camco Olympian RV aluminum jack stands are specially designed to secure and level your RV stability and positioning. These are made from cast aluminum and can support up to three tons or 6,000 pounds. These are very simple to use jack stands, requiring only the turn of a knob. The large bolt will lift or lower your camper or RV in no time. You can adjust the Camco Olympian stand from 11 inches to 17 inches and weighs only 3.55 pounds. When you purchase these stands, you are given a one -year warranty. This protects you against manufacturer’s defects on the products. If they aren’t up to your standards, the company will back you and replace your item. You can buy these in either two or four pack. If you’re looking for the best cheap jack stand for your camper or RV, this could be it. If you’re looking for a jack stand that is going to last a long time, well, depending on how you use it, then consider the Powerbuilt Bottle jack. 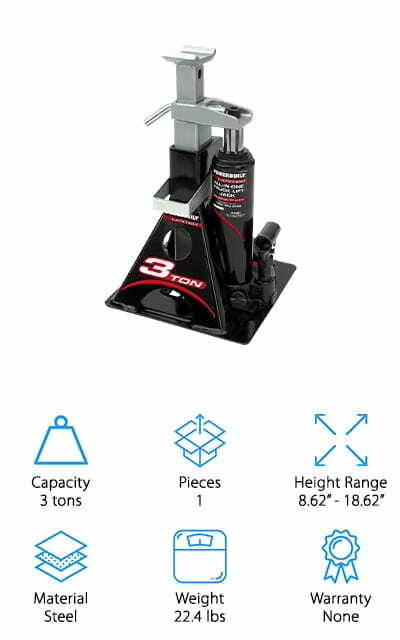 This is an all-in-one three ton floor jack with built in jack stands. The patented design combines a jack stand with a bottle jack all in one unit, hence its name. It can lift up to 6,000 pounds and it has the ability to lift your vehicle from 8 ¾ inches to 15 ⅝ inches. There is a wide steel base for added stability under the load of the vehicle and the safety bar will lock the unit into place at your desired height. It can lift small SUVs, CUVs, lighter pickup trucks, and cars. It meets or exceeds applicable standards set by the US Government along with the ANSI. It is safe to lift both unibody and body-on-frame vehicles. You can get this in a 2 ton extra low profile, and 4000 lb unijack style. Here we have a pair of Cartman ratchet jack stands that can hold up to three tons. For two of these stands, you won’t have to empty your entire wallet. They are very affordably priced and do a lot of what the more expensive ones do. 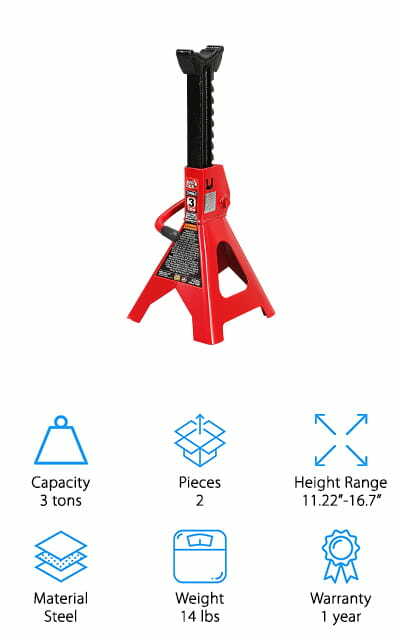 There is a quick adjustment mechanism attached to it that allows you to lower or heighten the jack stand at any given time. These can raise the car up from 10.9” all the way to 16.3”. It meets or exceeds all ANSI requirements. This one piece multi position ductile ratchet bar makes the use of the jack stand easy and comfortable for just about everybody. They’re also fairly lightweight, coming in at only 12 pounds per piece. The steel body of it adds to the weight and durability. They measure 13 x 7.9 x 7.9 inches and can be stored in many different areas. 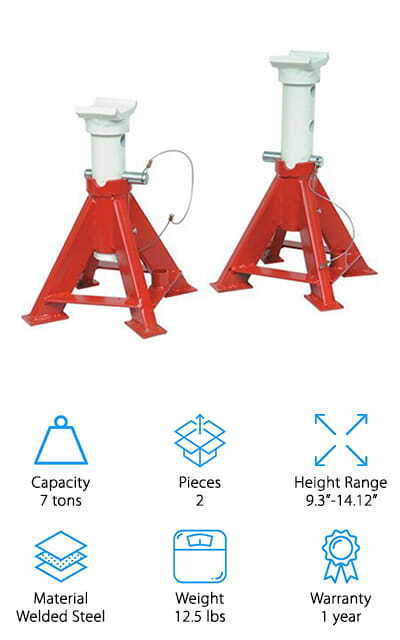 The Strongway Double-Locking 6 ton jack stands are made of solid high-grade steel, both body and handle. It is built for extra durability and quality. The finish is made from a lead-free paint that is chemically washed to ensure the finish lasts a long time. It is also oil, grease, and dirt-resistant for simple cleanup. 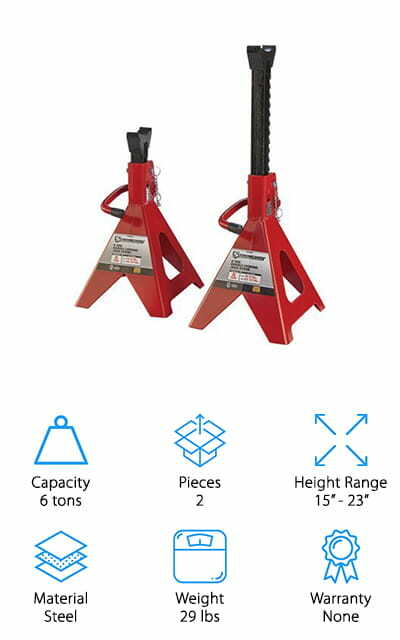 These jack stands feature a welded frame and a patented double-lock technology with a safety pin design for added safety and security. The self-locking ratchet makes it easy for you to make precise adjustments and it has a 3 15/16” X 1 1/4“ saddle for a larger working area and better contact with the load that is to be supported. With these, you get the best of both worlds-both ratchet and pin style jack stands. The bottom of these have a large base that resists sinking into asphalt and other surfaces similar. They meet ASME PALD 2009 standards and are built in ISO certified facilities. Craftsman is a name that almost any homeowner is familiar with. Their 4 ton jack delivers stable support to your vehicle. It features a welded steel construction and thick load-bearing teeth as well as a wide stance. 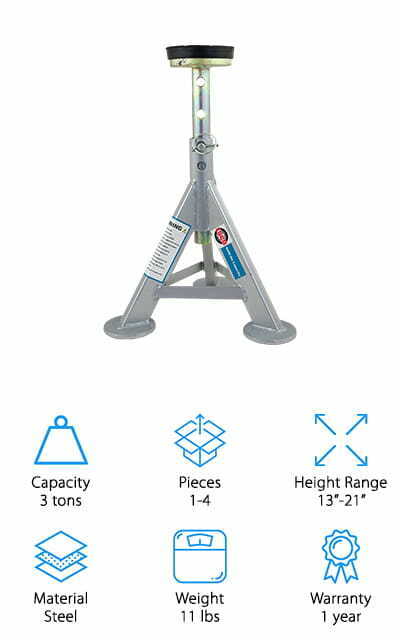 These heavy-duty tall jack stands also feature a counterweighted pawl that makes quick height adjustments from 12” to a high 18”. They will also lock into place to prevent a slip that could be catastrophic. The baked enamel coating helps prevent corrosion that could alter the strength of these stands. The solid welded construction allows these jack stands to support an astounding 8,000 pounds a piece. The wide saddle safely holds your vehicle in place and the sturdy set build will keep your car or truck in the air with ease. 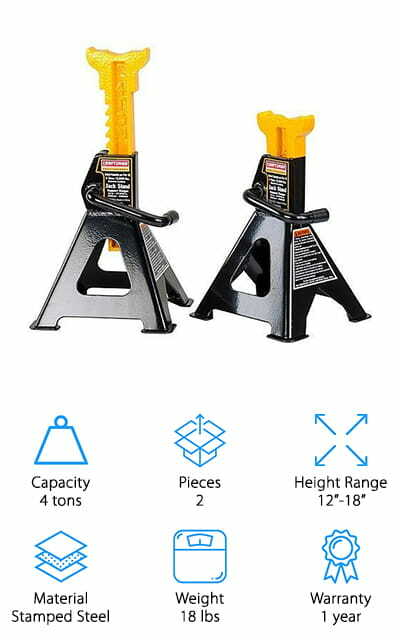 These US jack stands are painted a yellow and black color with a shiny appearance to them. You will get two of them with your purchase and a 1-year warranty comes with them as well. Designed with safety in mind, the Omega jack stand is built with a sturdy, welded steel construction. This adds to the durability and overall safety of the product. On the stand, you will find a one piece, ductile iron ratchet bar that allows you to easily change the height of the stand with ease. There is also a counter weighted pawl that allows you to securely lock the ratchet bar into place. This may make your job smooth and safe. The base of these jack stands is wide for added stability. With your purchase, you will get two of these items and each one has the ability to hold up to three tons. Each one weighs around eight pounds and you are given a one-year manufacturers warranty for your peace of mind. They are a black and white color and can be used in your shop, at your home, and in your garage with ease. These aren’t exactly flat top jack stands, but they’re pretty darn close to it. The Blackhawk pin style jack stands are sold and only to be used in pairs. They are made from heavy gauge steel to prevent twisting, which adds to the safety of the item. These stands can each hold up to seven tons. These are a pin style which means that the pin will hold the stand in place. The steel construction makes these heavy-duty and long lasting. If for some reason they aren’t up to your satisfaction, there is a one-year warranty that comes with them when you purchase the pair. These are painted a red and white color and can be used in your shop, outdoors, and in your garage for a variety of different vehicles and some lawn equipment. 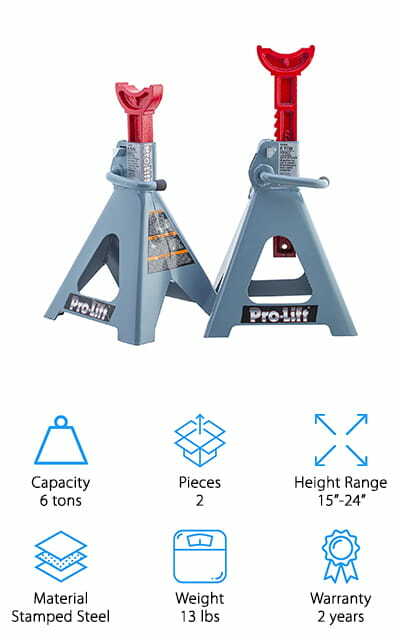 The Pro-Lift is great as heavy equipment jack stands as they can hold six tons. They are constructed of a stamped steel and feature a high-quality cast ductile iron ratchet bar. It comes with a smooth operating height adjustment mechanism that allows you to lift your car 15 inches all the way to 24 inches in the air. The release handle will lock into position when you are comfortable with the height. It is ideal for shop use, auto, and truck servicing. For your safety, it also comes with a double locking mechanism with both handle locks and a mobility pin. This ensures that there is a sage secure locking and to prevent accidental load disengagement. It meets ANSI and PALD standards as well. 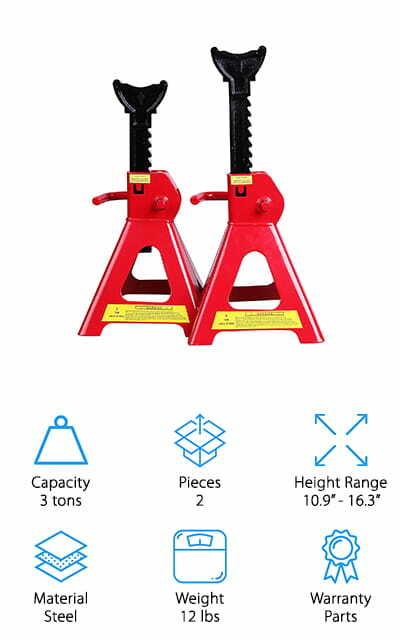 With your purchase, you are going to get two jack stands, which are each six tons. Each one weighs around 13 pounds and it comes with a generous two-year warranty for your convenience.